Air France has also released their promo awards for La Premiere, with awards discounted up to 50%. It means the awards are still pricey but the value is a little better as non-elites can now access the inventory. The award chart currently is exorbitant for first class awards (one way price). So the promo awards would cut that figure in the image by half. For one way awards only! The awards are valid for all destinations except North America, so that means a one-way between CDG and JNB is 97.5k. Alternatively a one way CDG-SIN is 130k, with around 400-500 in fuel surcharges. If you want to not pay the fuel surcharges you can fly from GRU. View from the Wing talks about how Club Carlson is changing their rules for moving points between accounts. According to a phone rep, non-elites will need to have their account open for at least one year, and transfers need to be between the same address that haven’t been changed for 30 days. Seems pretty reasonable for me although that cracks down on a lot of coupon connection trades. 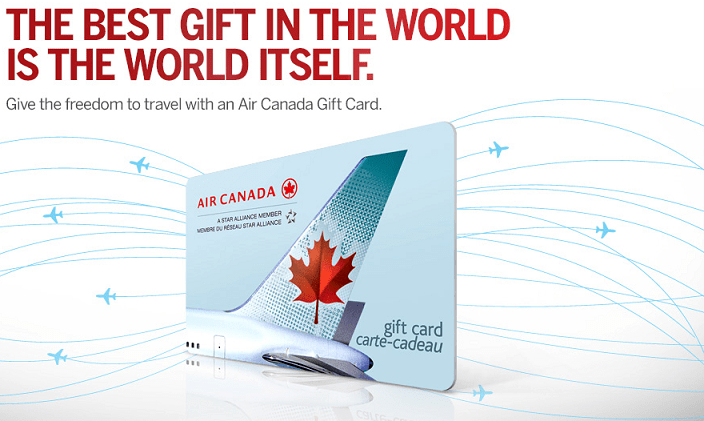 You are now also able to purchase Air Canada gift cards with loading a minimum amount of $25. Pretty straightforward. Details are here, terms and conditions are here. If you found this post useful, please consider following me on twitter as I often tweet/retweet info that is useful. Alternatively, you can signup for emails to get just one daily email for all posts – it may be much more convenient than checking my site for new content. Or if you really want to stalk me, this is my facebook and instagram. Hopefully you won’t be missing any more awesome posts! Thank you for the post! ARe the A380 routes part of the La Premiere sale? Actually I just checked and of the ones offered, CDG-JNB is the only one where A380 is is the plane. AF also flies A380 to Dubai but only in the winter (but this promo ends in mid-Sept.
I’m fairly sure SIN and NRT are also A380 destinations, but I haven’t checked! This is the website I looked at…. CDG-SIN for this week is 77W. Much easier to check out! Also, seems like they’re putting the A380 on PVG too.